Warmism has such slight claims to be science that belief in it it is clearly a religion, a faith. So when Piers Sellers, deputy director of Sciences and Exploration at the NASA Goddard Space Flight Center, was told that cancer would soon kill him he used that to evangelize for his faith. He managed to get a sob story into the NYT reporting his diagnosis and adding that he was sticking to his global warming work to the end. The piece had not even a pretence at scientific reporting. All it did was to regurgitate the usual Warmist assertions. So I initially disregarded it. Some of my fellow skeptics, however, were apparently irritated by the article. They felt that its emotional appeal might have some effect. And I can see that they may be right. So what could it be that kept this dying man going into his office to work on his climate-related projects? The conclusion you are supposed to draw is that the matter is so urgent that he felt he had to carry on. But he is in a position to know that global warming in fact stopped over 18 years ago -- so it's hard to see any urgency in that. Much more likely is Green/Left motivation. He wants to get people under better control by the elite -- among whom he no doubt thinks he belongs. His motivtion is an authoritarian one. He sees his work as helping to bring about a "new world order" in which people like him will rule the roost. He is indeed evangelical -- in a way that Hitler, Stalin and Mao would understand -- JR.
Steve Goddard has put up a post that adds to what I said yesterday about Phil Plait. See here. He even comments on two of the "handsome gentlemen" involved. I thought of doing the same but ended up being merciful for once. I am however rather pleased that there is another skeptic who can be as vitriolic as I can. Steve even puts up a graph that supports what I said about removing the 1998 El Nino from consideration. 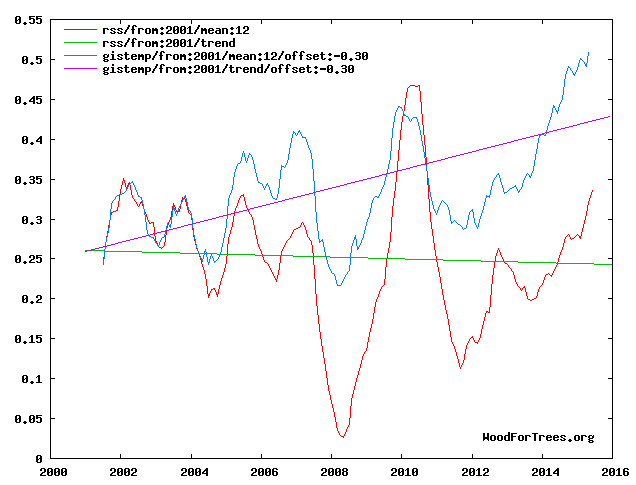 He shows a COOLING trend below (green line). Note however that the graph is calibrated in five hundredths of one degree so there is nothing important going on there. He further says: "They do have just one minor problem however. The 1995 IPCC report, authored by none other than NOAA's own Tom Karl, showed that satellite temperatures matched NOAA balloon data, and that neither showed any warming since 1979." The Australian Conservation Foundation reported that in recent years players have complained about the heat at the first grand-slam tournament of the year, including Canadian Frank Dancevic, who collapsed during a match in 2014. Analysis from University of Melbourne Atmosphere and Ocean researcher Ben Hague shows January temperatures in Melbourne have risen by 0.8 degrees Celsius each decade since 1987, but in the two weeks of the Australian Open the increase has been 1.25 degrees. The Bureau of Meteorology 2015 Climate Statement showed days of extreme weather are on the increase across Australia. A number of tennis clubs have implemented extreme heat policies to fulfill their duty of care to players, including Victoria based Australasian Academy of Tennis Coaches. "At our local tennis school, our heat policy is 35 degrees," their CEO Lynton Joseph said. "When the temperature hits 35, all lessons and play stops - there is no discussion. "The most recent science from the Bureau of Meteorology and others shows an increase in extreme weather days in Australia and sports clubs have a duty of care to take precautionary measures." Climate change manager at the Australian Conservation Foundation, Victoria McKenzie-McHarg, said global warming was the catalyst for the scorching temperatures. "Global warming is already having a big impact in Australia and the effect on both professional and local community sportspeople and sports clubs is significant," she said. "To stop these global warming impacts getting even worse, our government needs to support clean energy solutions that will cut pollution, and put the interests of the community ahead of the interests of a handful of big polluting energy companies. As David Cameron's Cabinet colleagues fan out across the media to tell us how catastrophic it would be for Britain to leave the EU, one minister is in a class of her own. It may not be surprising that Amber Rudd, as the sister of Roland Rudd - one of the leading lobbyists for Britain to stay in the EU - is a keen Europhile. But when our Energy and Climate Change Secretary claims, in a Daily Telegraph interview, that it would be bad for Britain's energy security and costs to be excluded from our leading role in the EU's "energy market", we have to ask what game she is playing. She obviously hopes we will not notice that the only thing which gives Britain a "leading role" in this respect is that we already have an energy policy quite different from anyone else's. We are the only country committed (by the Climate Change Act) to cutting our "CO2 emissions" by a staggering 80 per cent within 34 years. "The only way we play that leading role in the EU's 'energy market' that Ms Rudd boasts of is that we have committed ourselves to a policy entirely of our own making, the only results of which can be both to raise our costs and to threaten our energy security." We are aware, of course, that ever more of our energy is to come from grotesquely subsidised "renewables" (or "unreliables", as a friend calls them), which are themselves likely to add ever more billions to our energy bills. Plus, of course, there is the hope that the French and Chinese might one day build us a single nuclear power station, to produce the most costly nuclear electricity in the world. A similar shadow hangs over those gas-fired power stations which alone could provide the back-up to keep our lights on when the wind doesn't blow and the sun doesn't shine. Perhaps not so widely appreciated is that we are also subjecting those much cheaper fossil fuel energy sources to a double-whammy. They not only, unlike their renewable competitors, receive no subsidies. They are also having to pay a hefty tax on every ton of CO2 they emit, four times as high as that charged in the rest of Europe - which has already had a devastating effect on our energy-intensive manufacturing industries, such as steel, aluminium, cement and ceramics. So the only way we play that leading role in the EU's "energy market" that Ms Rudd boasts of is that we have committed ourselves to a policy entirely of our own making, the only results of which can be both to raise our costs and to threaten our energy security. Yet another bizarre consequence of this has followed December's Paris "deal" on climate change. When the EU signed up collectively to reduce its "carbon emissions", it took Peter Lilley MP to notice that Germany and France are now insisting that, since Britain is already committed to making such a disproportionately generous contribution to the EU's collective target, this will reduce the amount others will need to cut. The more Britain "takes the lead" in committing energy suicide, the less other countries need to follow. Nice one. A Washington state judge told environmentalists they could not use "necessity defense" to claim the threat of global warming justified their criminal activity - a huge blow to activists' hopes they can use global warming as a shield from the law. Judge Anthony Howard won't allow environmentalist defendants to make such arguments in their closing statements, according to a tweet from an environmental activist who tried to use this argument in a previous trial. So far, no U.S. judge has allowed eco-activists to use global warming as justification for breaking the law. Environmentalists claim Howard decided at the "last minute" not to allow activists to use the "necessity defense" argument to justify their trespassing on private property in 2014 to block rail cars carrying crude oil from traveling through Washington state. The "necessity defense" allows someone to commit a criminal act in a legitimate emergency situation to prevent a greater societal harm from occurring. Activists argued their actions were "justified and necessary in the fight against climate change, in light of government and corporate complacency." Environmentalists claimed they felt the harm from global warming was "imminent" and they had "no reasonable legal alternative" to fight against warming. They also got several "expert witnesses" to testify on their behalf, including a climate scientist who once claimed in 2009 that President Barack Obama only "has four years to save Earth." Activists also tried to claim railroad company BNSF punished whistleblowers who warned "of dangerous conditions or practices that seriously increase danger to employees and the public." Five activists built an 18-foot tripod in front of a parked train carrying crude oil in Everett, Wash., to block it from traversing the state. Activists also carried around a petition for Gov. Jay Inslee asking him to ban oil trains and any projects that would bring more fossil fuels through the state. "Effort after effort to control climate-twisting fossil fuel pollution has failed, globally, nationally and in my own state," activist Patrick Mazza said in a statement released in December. "There came a point where I could no longer sit back and wait for the politicians to act." All five protesters were arrested and charged with trespassing and blocking a train. As their trial approached, they argued the "necessity defense" to justify their crimes. Howard, however, eventually disagreed. For months, environmentalists have warned about trains carrying crude oil across the U.S. and derailing in highly populated areas. There were a series of accidents in early 2015 that prompted new federal rail car regulations for trains carrying crude oil, but the increase in rail traffic is because the U.S. is producing much more oil than in the past. Ironically, oil car derailments would be less of a problem if environmentalists didn't vehemently oppose pipelines to carry oil and natural gas. While rail is safe, pipelines are safer and don't cause major accidents when they spill hydrocarbons. Environmentalists, however, have ramped up their campaign against pipeline construction in the U.S., arguing they cause oil spills and contribute to global warming. The most notorious of these campaigns was the push to stop the Keystone XL pipeline from being built. Greens leader Richard Di Natale and his colleagues have vigorously opposed federal Coalition policies to impose criminal sanctions on corrupt union and employer officials. Unions are moving to widen their political influence before this year's federal election by pouring cash into the Greens, a strategy that is infuriating Labor and sparking accusations of disloyalty against union officials who are formally aligned with the ALP. The unions have already given the Greens more than $600,000 and are tipped to go further this year, just as the minor party tries to defeat Labor candidates in marginal electorates that will be -crucial to Bill Shorten's campaign. As the nation's biggest construction union comes under fire from the royal commission into union corruption, it and others have increased their donations to the Greens in a way that expands a powerful political alliance that challenges Labor. Greens leader Richard Di Natale and his colleagues have vigorously opposed federal Coalition policies to impose criminal sanctions on corrupt union and employer officials, restore the Australian Building and Construction Commission and scale back the proportion of union representatives on superannuation fund boards. There are divisions within the union movement over the donations, given that the construction division of the Construction Forestry Mining and Energy Union handed $125,000 to the Greens last year while the same union's mining division lashed out at Green policies to scale back coalmining. Anger at the trend is greatest among senior Labor figures who are frustrated that the CFMEU can use its numbers within the party to influence the selection of Labor candidates but then use its cash to help the Greens field rival candidates for the same seats. The CFMEU is the second biggest union supporter of the Greens after the Victorian branch of the Electrical Trades Union, which gave $360,000 to the Greens in the year to June 2014, the last year for which figures are available. Total union donations to the Greens reached almost $600,000 in 2013-14 following -donations of $50,000 the previous year and $100,000 in 2011 from the ETU's Victorian branch, with smaller amounts from several -unions over the past decade. Michael Danby, Labor member for Melbourne Ports and a strong critic of Greens policies, said: "Hundreds of thousands of dollars of the Greens political party's public funding is funnelled into defeating Labor represen-tatives. It's hard to see . what benefit it is to union members for the ETU or other unions to hand over their members' funds to Senator Di Natale and his Greens party, especially when the Greens have similar views to the Liberal Party on penalty rates." Senior Labor figures have privately urged union leaders to stop funding their political rivals but the complaints have failed to sway the CFMEU or the ETU. Most Labor MPs would not comment publicly on the dispute. Senator Di Natale has named Mr Danby's seat as well as the nearby Labor electorates of Batman (held by Labor frontbencher David Feeney) and Wills (held by retiring Labor MP Kelvin Thomson) as targets "within reach" this year. An effort is also under way to seize Labor territory such as Grayndler in NSW, which will be vulnerable to the Greens if sitting member Anthony Albanese, the opposition infrastructure spokesman, moves to another seat with a better chance of victory. One Labor figure said it was hard for ordinary party members to see officials from the CFMEU sway policy decisions and pre-selections but then give money to the Greens to campaign against Labor. Another warned that some -unions were taking a simplistic approach to politics but could not be convinced to stay loyal to the party that has traditionally backed workers. CFMEU construction division national secretary Dave Noonan dismissed the anonymous critics as "sooks" and rejected claims he and others were being disloyal to Labor by helping the Greens. "It's a matter for the union and determined by its democratically elected governing bodies," Mr Noonan said. "It is disclosed as required by law. The union is loyal to the interests of its members first and foremost." The ETU ended its affiliation with Labor in 2010, declaring that it would support whichever party "speaks genuinely" for workers. The union payments pale next to donations from mining and energy companies, which gave about $1.8 million to the Coalition and about $450,000 to Labor in 2013-14, but unions have the -capacity to offer more than cash. The National Tertiary Education Union was hailed for mounting a $1m campaign to support the Greens in the Senate at the last election, confirming its break with Labor. The NTEU's last filing with the electoral commission confirmed it spent $1m on political campaigning in 2013-14. Greens senator Lee Rhiannon countered the Labor complaints by arguing that the Greens had shown they would defend the -interest of workers. "Union allegiance has been to improving conditions for working people," Senator Rhiannon said. "The reason some unions have moved away from Labor is because Labor has changed. "We've won our stripes by doing the hard work and being consistent. The unions are not fools - they can see the political landscape is changing." With CFMEU officials facing legal action as a result of the royal commission, the government has demanded Labor and the Greens halt any donations from the militant union. Senator Di -Natale declined to comment but Australian Greens co-convener Penny Allman-Payne insisted the party would -accept donations just as other parties did. "It is the Australian Greens' long-held policy that elections should be publicly funded, to reduce the influence of political donations," she said. "Within the current system, the Australian Greens do accept donations, subject to the review of all donations above $1500 by our Donations Reference Group." The party also countered the idea that the donations influenced votes in the Senate, noting that the Greens had introduced legislation to abolish the ABCC in 2008 and its votes against the restoration of the ABCC were consistent with that position.